For our anniversary - as well as just for fun - we planned to go to Malaysia and Singapore with our French friends Xavier and Geraldine. After more than a month of planning (Geraldine did everything, she is an amazing travel-agent in disguise), we were really excited to go. With 1 week to cover 3 different locations, we knew it would be a crazy blast. I know if I give you a play-by-play of everything this will never get posted, so I will give you some highlights and some photos of each town we visited (although with over 700 photos, I regret there is a lot I can't fit on a blog post, ha ha!). First, we flew from Da Nang to Kuala Lumpur, Malaysia, as Air Asia was having an awesome sale on tickets and it's a direct flight. 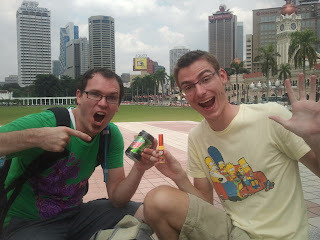 We really loved Kuala Lumpur. It was a refreshing and much needed balance of amazing Asian cultures and added development compared to Vietnam. I realized one thing I had been missing so much was diversity - in the states you had some (although not much in Utah County), but you at least have access to diverse ingredients and foods - even if they're not all that authentic. Anyhew, it was awesome to have such an amazing blend of Chinese, Malay, Indian, and western influence all in one. The language was really fun to hear, and the people were friendly and everyone seemed to speak a little bit of English at least, which made getting around town easier. I admit, coming from an area where I'd never met a Muslim before - not to mention the loads of bad press in the US - I was a bit nervous to see so many Muslims. However, I was very much delightedly surprised to find out how friendly and kind they are. The extremists in some places really make a bad name for the rest, we had a wonderful time visiting Mosques and interacting with amazingly friendly and kind people of many different faiths in Malaysia. The food was amazing, to say the least. 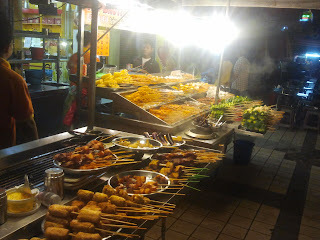 We had satay, a kind of kabob thing, wonderfully amazing cheese-filled nan bread that was so good it could kill you, noodles, McDonalds (that was a first for me since I can remember, it's been years), and so much yummy stuff I can't even name it all. We also introduced our (horrified) friends to the Utah County weirdness of dipping fries into ice cream/shakes at McD's, that was rather entertaining, and yummy. Satay our first night in town. You pick what you want and pay according to the color of the bottom of the stick, we had some greens, some chicken, mushrooms, and our friends let us try their eggplant. Our hotel was in the middle of China Town, inside the market, which was nuts! You had to go through this mass of little booths and stores to get to it, but it was a lot of fun. The room was ok, not the greatest ever (plus the elevator was broken so we had to walk up 3 flights one night), but it was a good price and the staff were really friendly so we liked it. 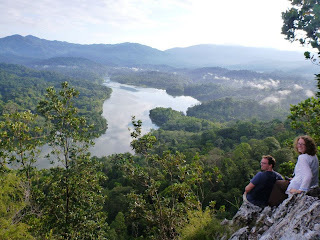 The price conversion in Malaysia is about 3 Ringgit for $1US, and it worked out really well for us, I didn't feel too stressed about money and we were able to have an enjoyable time. I was also thrilled to find supplements there - it was amazing! I got some all-natural bug spray that was cheaper than you could get in the US, and I bought some probiotics - I can't find them in Vietnam and I think they're the main thing keeping me from getting sick (I'm the only one so far who hasn't been sick here). It was so fun to look at the isles of supplements - they even had Solaray brand which comes from Utah! The convenience stores and the western-style roads and general lifestyle (everyone has a car, etc), really made me feel at home, but homesick as well. Our second day in Kuala Lumpur Michael and I woke up insanely early to go on a jungle hike through OpenSky Unlimited. It was SO much fun! It wasn't too pricey (well, I guess kinda pricey considering the prices of everything else), but it was well worth it. Our tourguide Amos picked us up at 6:30AM, and we drove out to just outside the big city, and within a few minutes we were in the jungle. It was so much fun, but man were the bugs BIG. The biggest mosquitoes I've ever seen (although their bites don't swell nearly as much as Vietnamese mosquitoes), not to mention loads of ants of all sizes. We hiked, climbed, and puffed our way to the top of a Quartz "mountain" ridge - we had to wear gloves to protect our hands - and the view from up top was amazing. For better pictures go to this - link - it's on the company's Facebook page. 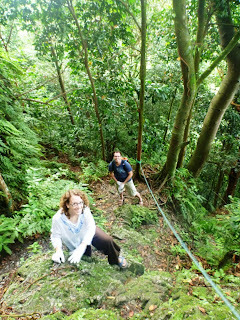 (We were silly and didn't find our camera charger until after the hike, and our camera died the day before, so sad!). After the hike Amos took us for lunch at another amazing Indian place, it's kind of like Indian fast-food, with naan breads and various other breads, daals, noodles, etc. And after a short rest and a shower at the hotel we went and walked our feet off around the city. Here's some photos - they're out of order according to time but I will just explain them as we go! 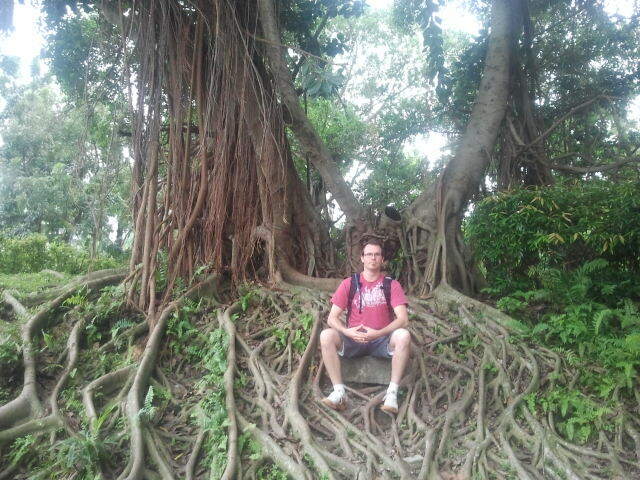 Here's Michael with one of the trees in the park behind the huge Petronas Towers in the city. One thing we really loved about KL was that there were trees everywhere, and it was so green and beautiful. On the beach we don't have many trees (too much sand or something), and we never really go into the hills to see trees - so we loved seeing the crazy huge trees in town. Here is a stand from the China Town Market selling roasted chestnuts. 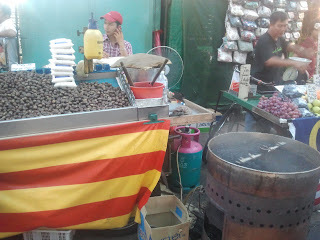 We didn't end up getting any, but the smell was really tasty - they take the chestnuts and put them in that large vat on the right that is full of dark, coal-looking things (maybe coffee beans even?) and they stir it up all day long. It sure smelled good! Our first night out we ate some amazing Indian food with a friend of Xavier's named Paul, and this is what they had in the cooler by the door - yes, that is CORN ice cream... no, we didn't try it. Honestly, we ate so much good food we couldn't if we tried! We had the cheese naan, tandoori chicken I think, and wonderfully thin bread (kind of like a crepe) cooked with Milo powder and bananas inside. Milo is kind of like Ovaltine, a chocolate-malt drink, and is all the rage in Malaysia. So good! 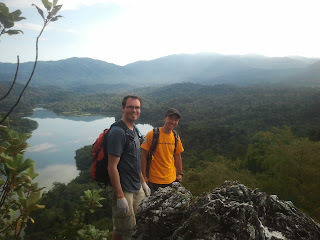 Here's Michael with Amos, our guide on the hike. It was just us and him, and he was super friendly and knowledgeable about what he is doing. We were really impressed with his company, he left the financial/law district to pursue his passion of the outdoors. The outdoor community is still small in Malaysia, he said some of the people he takes up this hike are from KL and never knew it was there! 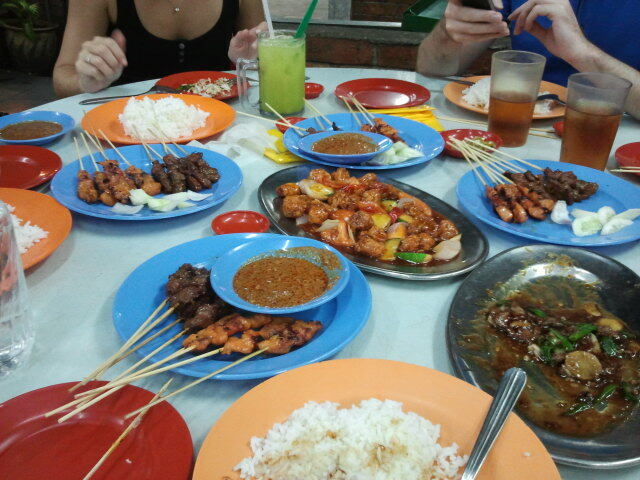 After the hike, Amos took us out for some great food. 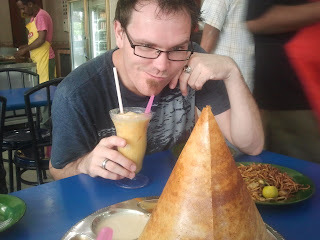 I don't remember names (they're written on Michael's phone so maybe I'll add them later), but the cone is a crisp-bread made from rice flour, and it came with Indian-style yogurt, yellow daal (a lentil dish), and another kind of curry to dip it in. Michael's drinking a mango lassi, which was also very yummy. One of the places we went to was a beautiful Indian temple called the Sri Mahamariamman temple, a Hindu temple. 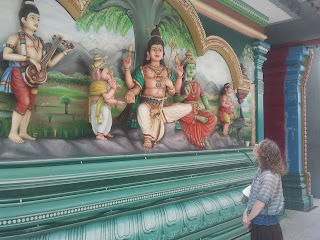 There were so many colors and designs everywhere, even an entire wall of different Hindu gods! You should google the place to get a better idea, I couldn't fit all of the pictures here. This was a fun photo in front of the KL post office I think? Michael and Xavier are thrilled about what you can get here in Malaysia - Mountain Dew and Push Pops! They even had Push Pops in France way back when, so Xavier was really excited to see them. On the left, outside of the photo, are a bunch of Dutch-style buildings from the Dutch occupation, and the building on the right, in the photo, is English-style I believe. A really cool building in KL, there were a lot of Islamic-style buildings around, all of the different architecture styles were a really fun part of the trip. Here's a shot of the Sephora store in the shopping district of KL. 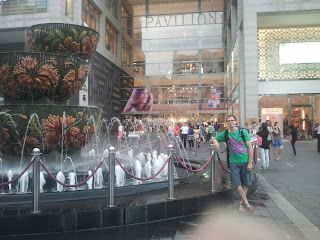 There were huge malls everywhere! 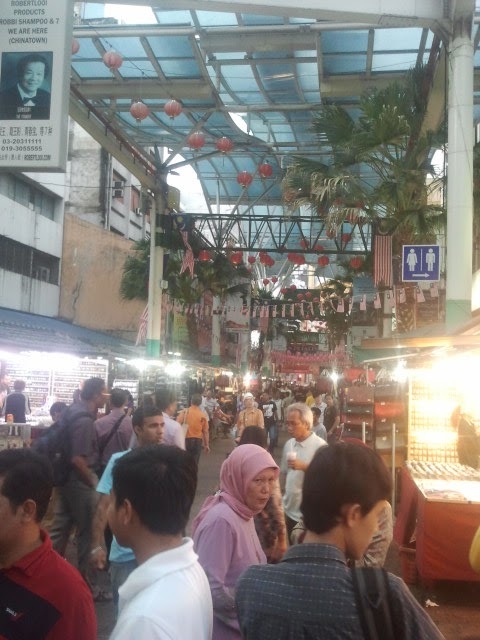 We even visited this awesome mall with something like 100 food shops in the basement - Amos said the owner was a real foodie so he spent a long time trying the street food around KL, and he decided to gather the best of all of them to put in his mall and keep the businesses going. We got some really good ice-cream-like stuff, the guy took a big block of frozen something out of the freezer and put it in a machine that shaved it off kind of like a snow cone, but the texture was creamy. We got strawberry flavor, and it was really yummy until we noticed the yellow stuff he had put on as topping was creamed corn! Ha ha, we had chocolate cereal bits, creamed corn, and strawberries on our ice cream. Surprisingly it wasn't too bad, but we were weirded out so we tried not to eat the corn after that. Here's Michael at one of the huge malls. 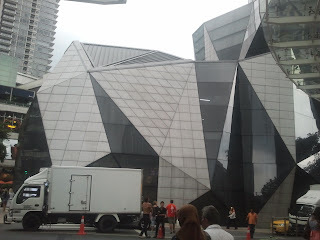 It was crazy to have such a variety of things in KL. You had the jungle just a short drive out of town, the poorer homes that look like Vietnam, the British architecture, the dirty parts of town, and then the huge, developed western part that was full of expensive shopping malls. 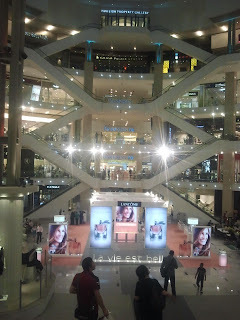 Here's the inside of the mall - it was one of the biggest malls I've ever been in, it was so crazy. We even visited a mall that was entirely electronic stores inside - 5 floors of stores to be precise. It was a lot of fun, and the bathrooms there were so beautiful I almost cried. Here's some more delicious-ness we had our last night in KL. We ate with Paul again, and he took us to this street that was only food stalls, it was really fun. There was Turkish ice-cream, Chinese, Japanese, Indian, anything you could want. We ate at this place with Satay and Chinese, which Paul says is the best - apparently so as we were finishing up we saw some big guys with earpieces in inside, and then they left with a group of people between them. Everyone was making a fuss but none of us recognized them - then finally a local told us it was the Jonas Brothers, ha ha! I had a celebrity entourage walk right next to me and I didn't even know it. Here's another view from up top on our hike. I downloaded from FB some of the photos Amos took for us and the colors went all weird, so I encourage looking at them online for better views - Michael is tagged in them. It was a beautiful hike! My legs hurt SO bad afterward I thought my thighs would explode. But it was worth every pain-staking minute of inching down stairs like a little old lady for the rest of the week. 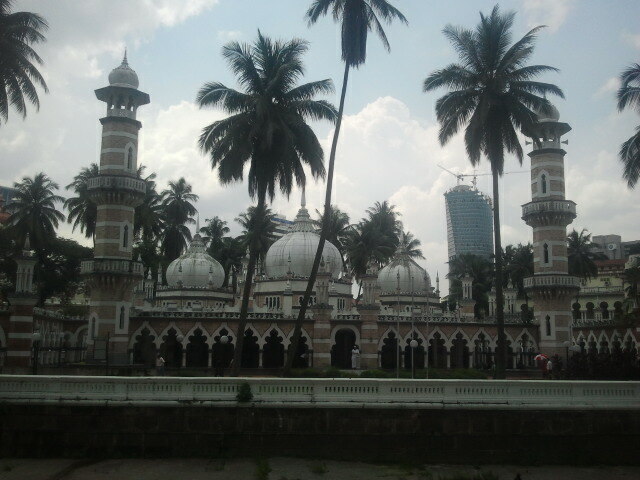 Here we are in the National Mosque in KL. I found it really neat that they would let you go in to see it, you just had to cover yourself with these lovely purple outfits - women wear the hood, men don't have to, and you have to take off your shoes. It was really beautiful inside, and we saw the main prayer room where a lovely woman from the Netherlands explained the basic principles of Islam to us and told us about the temple. The main prayer room had really beautiful walls - they were so delicately and dramatically textured. It was really neat though to see how many similarities there are between our beliefs and theirs, and it was a really beautiful place to see. There were amazing towers everywhere - this one was Michael's favorite. I think it's called the Dayabumi Complex, or something. He was fascinated though, it was a really unique style. And finally, here we are at the main landmark of Kuala Lumpur - the Petronas Towers. There was a huge mall inside that offered some nice AC, but we didn't have the needed moolah to go up to the walkway - which was fine, apparently you can only go at a certain time of day. We had so much fun in this great city, it was everything I had been hoping Asia would be like. We had a great/crazy time navigating the metro system around town, and we even saw two sister missionaries at one point! (I recognized the way they wore their clothes!) I was really bummed because we only had time to wave hello to them as our metro train was loading, but at least we saw some other members after 3 months of being on our own. In the end, it was 3 spectacular nights and 2 amazing days in Kuala Lumpur, then the next day we were off to Melaka, Malaysia! I LOVE THE TREES!! Those trees you got to be around are incredible! 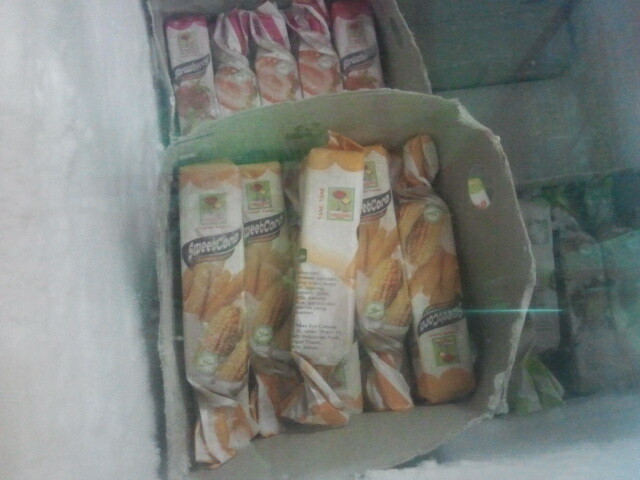 Corn icecream? craziness! But I guess it's similar to all the americans that put ketchup on everything. ;) I saw the pictures from the hike and they are soooooo cool! The Orchid park sounds lovely and I would love to see all your flower photos. The last photo of you guys in front of that complex is fun because it makes you look like giants! I'm so glad you're sharing all this amazing stuff with us through your blog! Wow wow wow. Mike's sister lived there a few years back and loved it there. Wish we could have afforded to go there after seeing your pictures and hearing all the cool stuff you did. How beautiful! You are becoming so cultured. I know it is hard to be away from family and friends but what a trade off!